Context: Students, who are healthy, active, and well nourished, are likely to attend schools regularly which accelerate their learning process. Poor oral health has a profound effect on general health and quality of life. Aims: The aim of this study was to assess the oral health status of Martyr Memorial Residential School Children of Sunsari, Nepal, during 5-year period and also to assess the effectiveness of school oral health program. Settings and Design: A retrospective longitudinal study was carried out among Martyr Memorial Residential School children. Subjects and Methods: Aretrospective longitudinal study was performed among 411 school children of Martyr Memorial Residential School, Sunsari, Nepal. Five years' data of children were collected from the department record forms from 2009 to 2014. Data on demographic parameters, oral health condition (Decayed, Missing, and Filled Teeth [DMFT], oral hygiene status, type of dentition, malocclusion, and diet history), and treatment done for each child were collected from the surveyed forms. Statistical Analysis Used: Frequency distribution, prevalence, and incidence of dental caries were calculated. 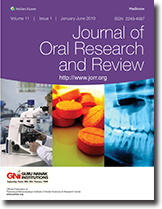 Results: This study showed that the prevalence of dental caries in 2009, 2010, 2011, 2012, 2013, and 2014 was 21.0%, 23%, 29.1%, 10.0%, 13.5%, and 30.9%, respectively. 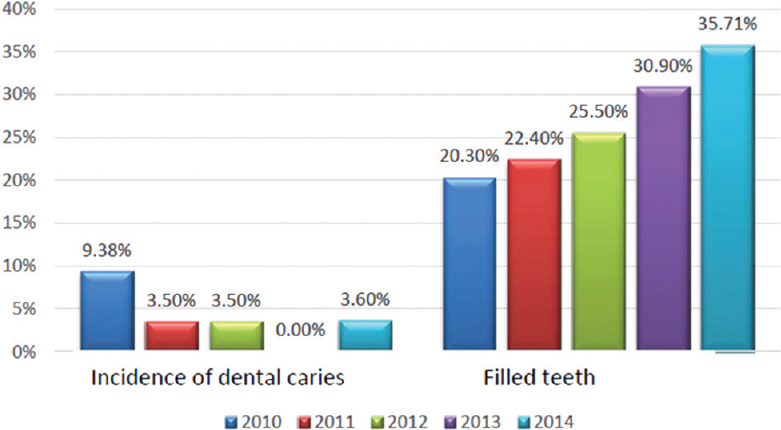 The incidence of dental caries in permanent dentition was high (22.0%) in 2011 follow-up. None of the dentition developed new cavity in 2010 follow-up period. More than half of the children had good oral hygiene status in 2012, whereas only 32.9% had so in 2009. Majority (95.5%) of the enrolled children had normal occlusion. Conclusions: This study showed the overall positive impact on the children's prevalence and incidence of dental caries as well as on oral hygiene status. 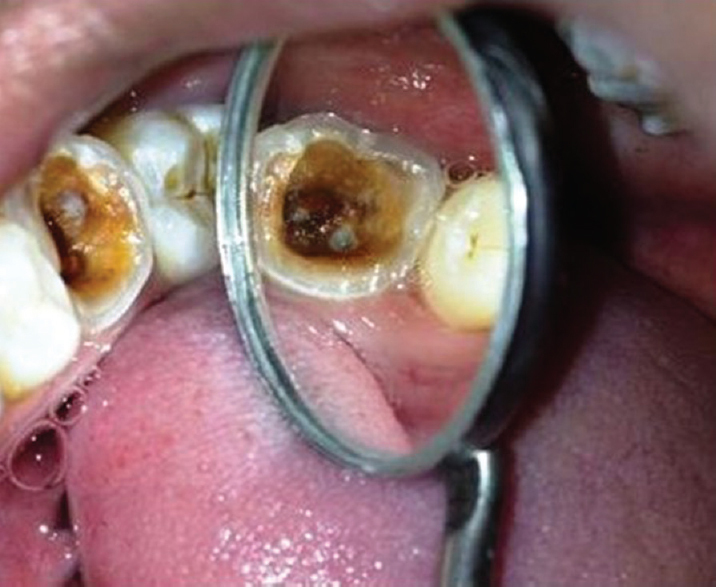 The incidence of developing new caries in both types of dentition decreased. There was an increase in filled component of DMFT/decayed, filled teeth index. Most of them had good oral hygiene status at the end of the study. Background: While a number of studies in the Western countries have provided estimates of prevalence for child psychiatric morbidity and associated risk factors, relatively little is known about child psychiatric problems and risk factors in developing countries like India. Aim: The aim of this study was to assess the patients' emotional status in an age group of 3–14 years to evaluate children's cooperative potential. Methodology: The Goodman's Strengths and Difficulties Questionnaire assessing the mental health status of the child was distributed to the Vidharbhan population attending the dental hospital. A cross-sectional survey including 168 children aged 3–14 years who were instructed how to fill the questions participated in the study. Results: Overall 53% of the children belonged to the normal category, whereas 33% and 14% were under abnormal and borderline categories, respectively. The abnormal category was slightly higher in the age groups of 3.1–5 (35%) and 11.1–14 (28%) years. Similar to certain studies, the mental health problems with males (52.9%) were higher than that of females (47.6%). Conclusion: Identifying the mental health problems of the child seeking dental treatment will help the dentist to formulate an idea of the child's emotional status at the time of treatment and thereby make proper amendments during the treatment procedure. There is a need for developing programs to train, sensitize, and mobilize teachers and parents regarding children's psychological, emotional, and behavioral problems, with special attention to the common population. Introduction: Evaluation of the effectiveness of a well-targeted educational campaign specially designed toward the improvement of oral health and maintenance of removable orthodontic appliances should be considered during an orthodontic treatment. Objectives: The objective of this study was to assess the impact of the oral hygiene protocol on oral health through assessing plaque accumulation on the removable orthodontic appliance, to establish the impact of oral hygiene protocol on oral health through assessing the patients' plaque accumulation on the tooth surface and gingival bleeding, and to evaluate the degree of halitosis between the intervention and control groups. Materials and Methods: The study involved 80 patients who were equally assigned to the intervention and control removable orthodontic treatment groups. Data were collected by means of questionnaires, soft-tissue examination, breath checker, and staining the appliance with methylene blue disclosing solution. Results: The plaque score of both groups at Review 2 emphasized a significant difference (P = 0.021), yet neither differences at baseline (P = 0.989) nor Review 1 (P = 0.786) were found. The odor score of both groups at Review 2 showed a significant difference (P = 0.012). All interventional patients and only 10% of the control group patients were aware of appliance removal during sport. There was no significant difference (P = 0.211) between the responses of patients concerning the cleaning method of the appliance. The patients showed a higher user rate of mouthwash, and they were more successful with respect to when it should be used. Conclusion: The effectiveness of an educational session has been demonstrated in some aspects of the research. Introduction: Demonstration and training on the live subject are not always an optimal means of introducing students to suturing technique. The use of live patient as a test subject is not acceptable with today's ethical standard. It would be advantageous to use a preclinical training model that impersonates real-life conditions, through which manual dexterity and a high degree of psychomotor skill can be achieved. This helps to master the suturing technique under semi-realistic circumstances at an affordable cost. The model most closely resembling the actual condition should be considered. Materials and Methods: A total of 54 postgraduate students participated in the study. The material required for both the models were distributed among participants and asked to prepare the models. Then, suturing was performed on models, and the questionnaires were given for feedback. Model 1: Require orange peel, alginate impression material, and dental stone. Model 2: Require mackintosh, sponge, alginate impression material, and glass slab. Depending on the questionnaire, response results were calculated. Results: All participants experienced that glass slab model was more durable than the orange model. Thirty-six participants experienced that orange model is easy to prepare compared to glass slab model. There was a significant linear trend among the ordered categories seen using Chi-square test. Conclusion: According to the participant's preference orange model was better in all aspects such as ease of preparation, the passage of suture needle, and the time required for suturing compared to glass slab model which was more durable and less gaping experienced with it. 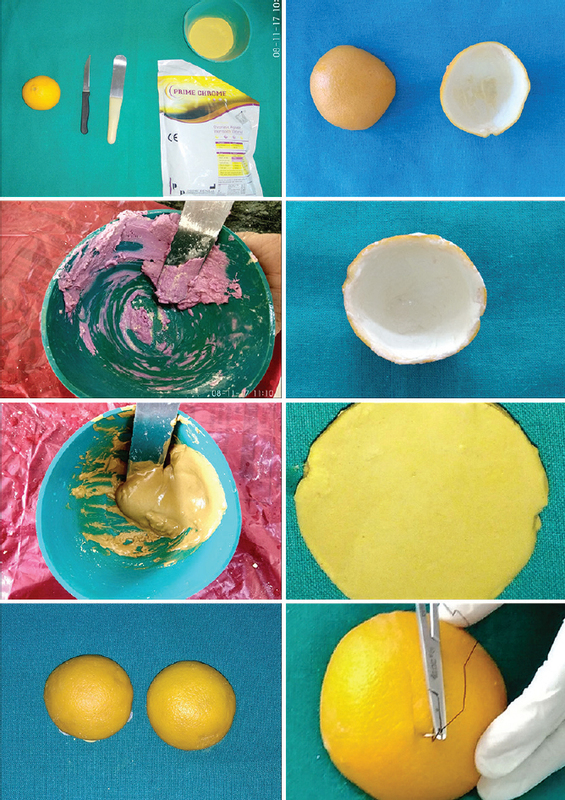 Hence, we concluded that orange model was better for preclinical suturing training. Salivary duct carcinoma (SDC) is a rare, highly aggressive neoplasm representing about 1%–3% of all malignant salivary gland tumors. 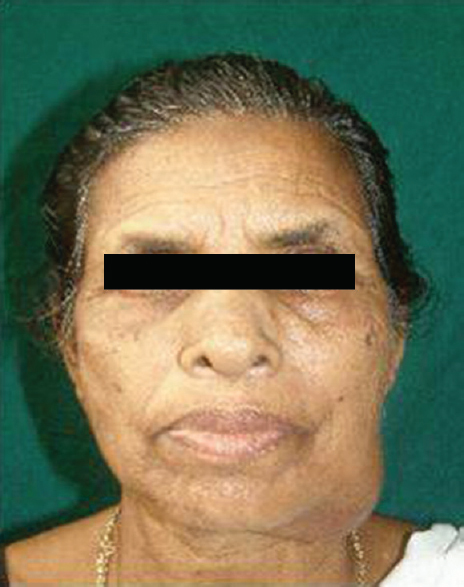 Approximately, 85% of the cases occur in the parotid gland followed by the submandibular gland and minor salivary gland. Pathomorphologically, these tumors showed great similarities to ductal carcinoma of the female breast, which is why they described this tumor as “SDC.” This article highlights a case of rapidly growing swelling in the left mandibular region in a 60-year-old female. As this entity is rare and highly aggressive, an early detection followed by appropriate treatment is very important to improve the survival rate of the patient. Double lip is a rare deformity of the face, which can occur as congenital and acquired anomaly. 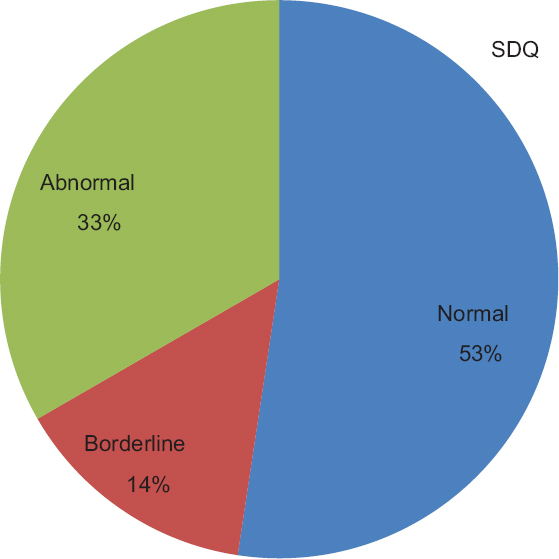 It most often appears as syndromic variety along with systemic manifestations. It is a rare occurrence with slight male predilection. 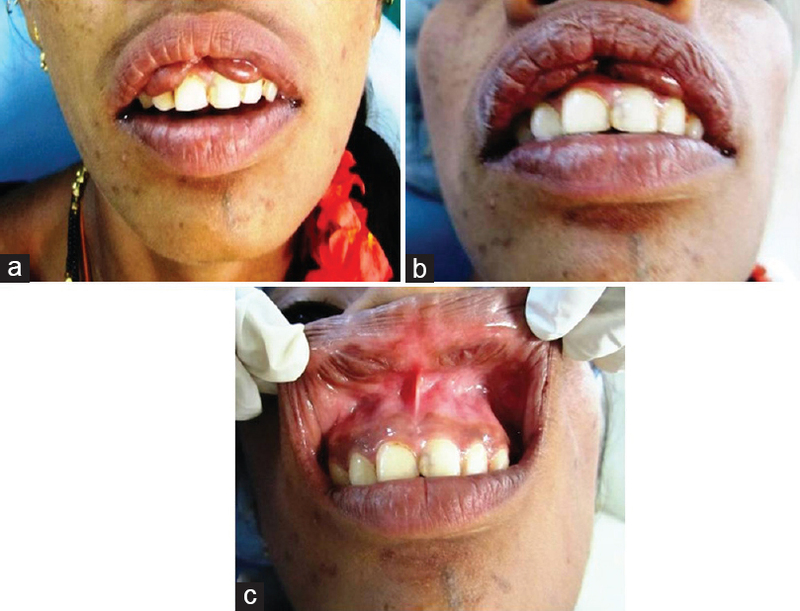 This article is a report of a 20-year-old female presented with the acquired double upper lip for 1 year developed after orthodontic treatment. Gingival enlargement is the most common side effect which is reported with the administration of the anti-epilepsy drug phenytoin (PHT). It is of vital importance as it greatly affects the esthetics and also interferes with the mastication and oral hygiene practices. It is now well known that the presence of gingival inflammation resulting from poor oral hygiene acts as a major risk factor and leads to worsening the condition. Therefore, the patients taking PHT should be made aware of the possible outcomes and the importance of maintaining oral hygiene and periodontal maintenance therapy. This case report describes a case of PHT-induced gingival enlargement in which surgical intervention was done to correct the gingival enlargement, and in spite of patient not discontinuing the drug (PHT), no recurrence of enlargement was seen even after 1 year. The management of teeth with minimal coronal structure can be a challenging task when root canal treatment is required as a part of oral rehabilitation. Coronal leakage, isolation complexities, and risk of interappointment coronal-radicular fracture may be major contributors to endodontic failure. It is a great challenge to an endodontist to maintain root canal patency while isolating grossly destructed tooth with open pulp chamber, without blocking the root canals with restorative material. Pre-endodontic build-up of the coronal tooth structure following caries removal and identification of all the canal orifices while maintaining the canal patency can facilitate the endodontic process by providing a strong core and coronal seal. Hence, a restoration before endodontic treatment is mandatory during management of these teeth. This can be achieved successfully by the canal projection technique, wherein a tapered plastic sleeve is used to maintain the canal patency, projecting the canal from pulp chamber to cavosurface margin. Taking into consideration the limited worldwide availability and cost of original projectors, the aim of the present case is to highlight a simple yet effective method of placement of a pre-endodontic restoration using the canal projection technique by custom made plastic sleeves. This case report demonstrates the use of an innovative technique for canal projection, as an efficient method for managing complex cases. Tobacco use is the single greatest preventable cause of death in the world. Most tobacco users want to quit but find it difficult to stop due to the addictiveness of nicotine. 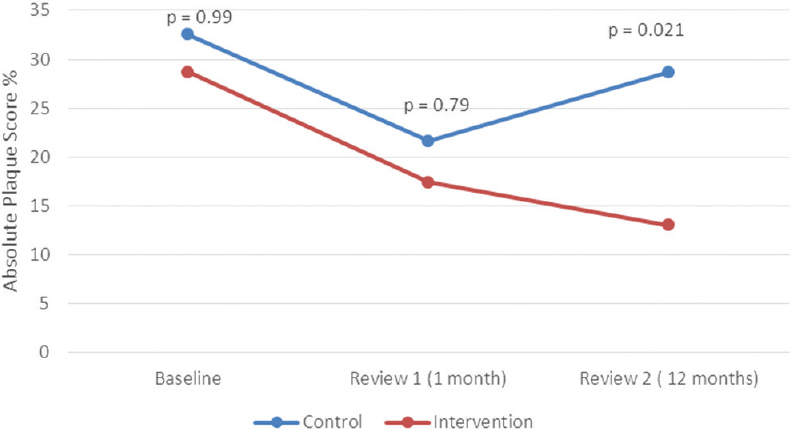 Interventions for tobacco cessation are important in enabling tobacco users to stop using, which includes pharmacological and nonpharmacological approaches to aid tobacco cessation. Pharmacological approaches include nicotine replacement therapy (NRT) and nonnicotine medications (bupropion and varenicline). NRT delivers nontoxic forms of nicotine to help tobacco user's deal with nicotine cravings and maintains stimulation of the nicotine receptors. Forms of delivery for NRT include the following: nicotine chewing gum, nicotine lozenge, transdermal patch, nicotine inhaler, nicotine nasal spray, and nicotine sublingual tablets. These NRTs are in general well tolerated and have minimal adverse effects. The present review gives an overview about various modes of NRT methods currently used to treat nicotine dependence. The periodontal lesions with cellular proliferation can be assessed by various methods. One of the methods to determine the proliferative activity is silver-staining argyrophilic nucleolar organizer region (AgNOR) staining. 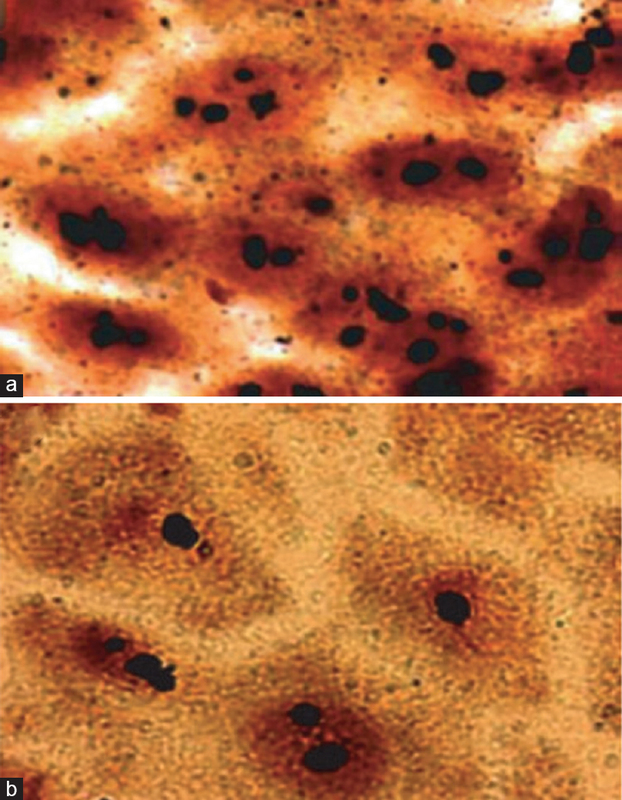 AgNOR can be used as diagnostic and prognostic tool for many of periodontal lesions which are proliferative in nature and may be quantitative marker of incipient cellular alterations before the histologic hallmarks appear. Hence, this paper reviewed about the periodontal applications of AgNOR staining.